The remaining partner in Small Planet Trading: Gifts and Goods from the Global Village is looking for a buyer to carry on the vision of providing a “fair trade” link between producers of hand-crafted products and appreciative consumers. 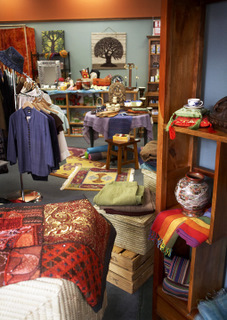 DeLona Campos-Davis, with friends Amy Hassett, Pamela Larsen, and Karen Murphy, started Pachamama as a holiday gift store out of the Columbia Gorge Ecology Center in 2003. They opened full-time as Small Planet in the Oak Mall, behind Bette’s Place, in 2005, then shifted to their current location at 202 Cascade Ave. Suite B in 2008 when Ikote Beads headed south to the corner of 3rd and Oak (now home to Underpinnings). Along the way, Hassett and Larsen dropped away and Shannon Knapp joined as a partner. Knapp left a year ago, and Murphy is now pursuing other ventures, so Campos-Davis thinks it might be time for fresh blood. She talks about some of the thinking that led to the sale decision at her blog. She’s asking $69,000 for the business. A buyer would take over a lease that has two years remaining at $650 a month, plus utilities. In exchange, a new owner would get a turn-key operation with an established network of local artists and global talent connected through regional wholesalers certified by the Fair Trade Federation. “For us, it’s a philosophy of doing business that takes into account the people and the planet,” Campos-Davis says. She says the store isn’t closing. She will provide all training to a buyer. Campos-Davis says she also is open to new investor-partners. “I’m open to creative opportunities,” she says. Interested? Drop an e-mail, or phone her at 541-387-2008.